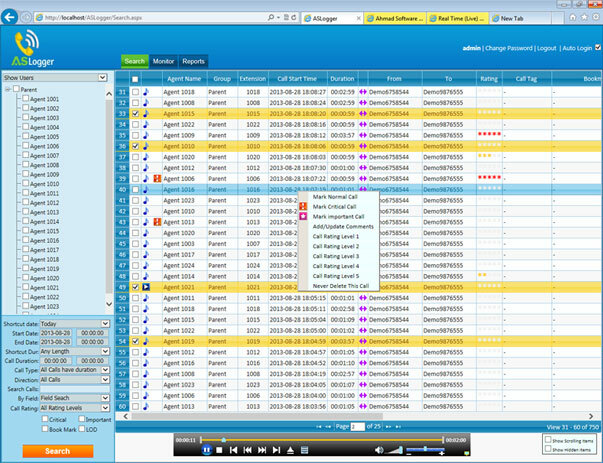 ASLogger call recording software provides a sofisticated, easy and fast call searching using different types of search filters on the same page withour any popup.There are single click date, time and call duration filter to make selection fast. Call searching is very easy and fast using different types of search filters. All the Call Searching filters are on a single screen to make search easier and fast as compared to different popup to apply search filters. There are single click date and call duration filter to make selection fast. "Keep Call on System" during backup.